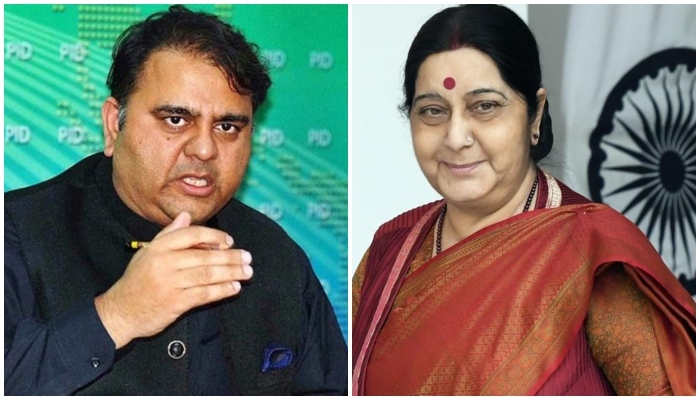 ISLAMABAD: Federal Minister for Information Fawad Chaudhry, responding to Indian External Affairs Minister Sushma Swaraj, said Prime Minister Imran Khan’s ‘Naya Pakistan’ was not Modi’s India, after she sought details from the Indian envoy in Pakistan on the reported abduction and forced conversion of two Hindu teenage girls in Sindh. “Mam its Pakistan’s internal issue and rest assured its not Modi’s India where minorities are subjugated its Imran Khan’s Naya Pak where white color of our flag is equally dearer to us,” Chaudhry replied to Swaraj’s tweet, in which she said she had asked the Indian High Commissioner in Pakistan to send a report on the alleged kidnapping and underage marriages. 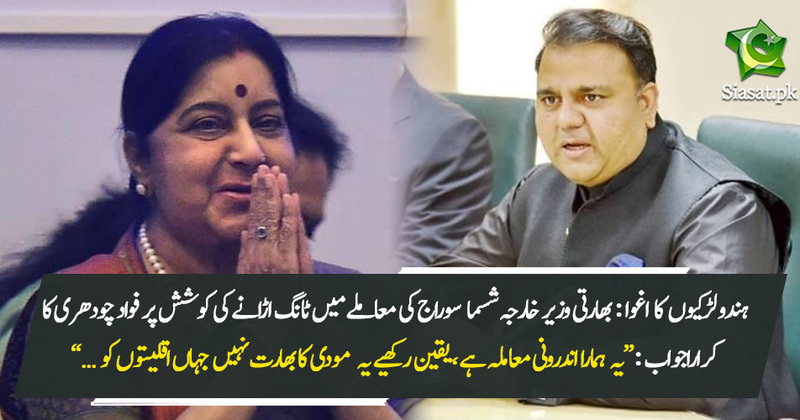 “I hope you ll act with same diligence when it comes to rights of Indian Minorities,” the info minister added in his rejoinder to the Indian foreign minister. Prime Minister Imran Khan earlier ordered Sindh government to launch probe into reports of abduction, forced conversion and underage marriages of the two teenage Hindu girls and to take immediate steps for their recovery. In a Twitter post earlier today, Fawad Chaudhry informed that Prime Minister Imran had issued directives to the Sindh chief minister to look into reports that the girls in question have been taken to Rahim Yar Khan. The incident came to light after the father and brother of the girls, in videos that went viral on social media, said that the two sisters were abducted and forcefully converted to Islam. In a separate video, however, the minor girls can be seen saying that they accepted Islam of their own free will. Fawad Chaudry should work on his English. ‘Indian minorities’ or minorities in India? I think foreign ministry is the right platform to respond to those kind of diplomatic tactics. Their views are listened to more.